Looking for something a little out-of-the-ordinary to plant in your fall garden? Why not give Swiss chard a try? Swiss chard makes a healthy addition to the cool-season garden; it contains no fat, is low in calories and cholesterol and is a good source for vitamins A & C as well as calcium and iron. It is easy to grow as long as its basic requirements are met: full sun (or at least 6 hours of sun per day), and a fertile, well-drained soil. Incorporate 2”-4” of a good-quality soil amendment into the planting bed, along with some pre-plant fertilizer. If planting seedlings, space them 12” apart. Swiss chard can be substituted for spinach in any recipe and the crisp ribs of the plant can be grilled for a unique side dish. When the weather warms up in the spring, the plant will “bolt” (produce flowers). 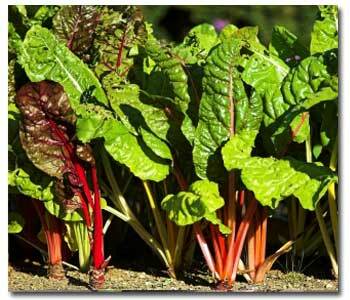 This is your cue that it’s time to remove your chard plants and replace them with a warm-season vegetable of your choice.